In Factories of Knowledge, Industries of Creativity, the Viennese philosopher Gerald Raunig takes a critical look at the evolution of two social domains: education and creativity. His core concept is “modulation”. According to Raunig, it is a phenomenon that affects both present-day universities and the art world. Raunig sees modulation in a twofold way, namely as “a striating, standardizing, modularizing process and at the same time a permanent movement of remodeling, modulating, re-forming and de-forming the self” (Raunig: 29). In taking this approach, he summarises, in a highly original manner, the contemporary trends of regulation and technocratic and bureaucratic rule, on the one hand, and permanent change management, on the other. The entire system of quantitative evaluations, impact factors, time management and external accreditations is modulating universities, undermining their autonomy, and the same goes for the domain of creativity, where it is mainly the low wages, the institutionalised exploitation and self-exploitation, but also the artist rankings and the index numbers of art institutions that measure the value of the art world. In this respect, modulation resembles a system of policies based on mensuration. Such policies constantly measure everything in order to exercise control, while, at the same time, continually adjusting the standard of measurement itself to ensure that those who define the measure and enforce it can maintain their hegemony. In such a system, the content of both knowledge transfer and creative products hardly matters anymore. 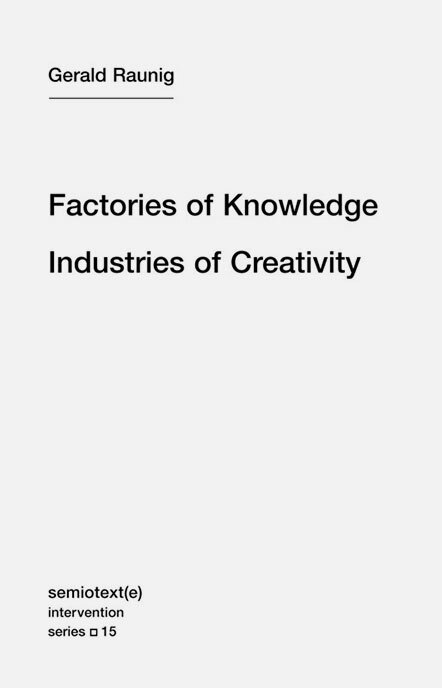 Knowledge factories and creative industries continue to run smoothly as long as they stay within the prescribed measures. The examples that Raunig provides and the mechanisms he describes have been cited many times over the past few years by critical social scientists, psychologists, sociologists, educationalists and philosophers alike. As for the creative domain, Raunig himself has also made an interesting contribution to the debate in the recent past as the co-editor of the collections of essays Art and Contemporary Critical Practice (2009) and Critique of Creativity (2011), both published by Mayfly. The merit of Factories of Knowledge, Industries of Creativity is that it summarises the problem in a sometimes literally punctilious and concise manner. The book’s strong point, however, is its philosophical interpretation, which is mainly inspired by the works of Gilles Deleuze and Felix Guattari, on the one hand, and by the Marxist / Neo-Marxist “school”, on the other. This school includes Adorno, Horkheimer, Virno and, of course, Marx himself and so it is probably no coincidence that the world-renowned philosopher Antonio Negri wrote the book’s afterword. And then there is the wonderful metaphor of Josephine, a peculiar singer who is part of a population of mice. Raunig uses Franz Kafka’s protagonists from the short story “Josephine the Singer, or The Mouse Folk”, to explain in great detail how singularity relates to the multitude and how the particular virtuosity of the artist measures up to a crowd that has little understanding of the music. Despite the general ignorance and Josephine’s “weak event”, her weak artistic activities, provide the foundation for new assemblages among the mice. This small, insignificant mouse with her equally insignificant and curious talent, may in fact provide a way out of modular society. Like Michel Foucault, Raunig seems to have a firm belief in the capacity of art to shape new ways of life. “Aesthetics as ethics”, as he calls it, “forming life as living together”. In order to achieve this, Raunig hopes that a “molecular activism” will emerge, in which disobedient and non-subservient ways of living will be tested by the exchange of relationships between many singularities instead of by individual heroes. This type of activism does not take aim at the big, centralised power of the State, but at inconspicuous everyday life. Josephine’s weaknesses help deterritorialise and assemble the multitudes at the grassroots level. However, Raunig doesn’t really make it very clear how all this is supposed to take place, and that is perhaps the weak point of his book. Like the greatest social critics, this philosopher is very acute and clear in his analyses, but his sketch of the escape routes or “solutions” leans heavily on metaphors and philosophical abstractions. But this takes nothing away from the fact that he provides food for thought and, perhaps even better, calls for actions that may help provide a concrete empirical basis for these abstractions. “We need a new ‘Josephine’…”, Antonio Negri declares in the afterword. In any case, Factories of Knowledge, Industries of Creativity does “sound” like the singing of the singular. We now have to wait for the choir of the multitude to break open contemporary modular time with a performative chorus that will go on echoing and will no longer be ignored.